The songs and madrigals of early17th-century Italy are dramatic microcosms – arias from unwritten operas that carry the emotional and dramatic weight of their silent context. This new disc explores the rich musical worlds of musical miniaturists, whose skill is all in the detail. Drama is immediately to the fore. We open in literal discord, as Giulio Romano’s ‘Strana armonia d’amore’ conjures the ‘strange harmony of love’. It seizes the ear and holds our attention as it unfolds in freewheeling, recitative-like convulsions. 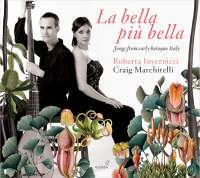 Invernizzi and Marchitelli display the full range of this repertoire in their choices, from the swaying dance of Ferrari’s ‘Son ruinato’, wearing its tragedy lightly, to the unblinking intensity of Caccini’s ‘Torna, deh torna’ and the improvisatory, arioso freedom of Strozzi’s ‘Udite amanti’. Invernizzi’s delivery is forthright, refusing to relax and bloom into vibrato until the very last, digging deep into the suspensions that give this music its emotional friction. She delivers operatic scope within the intimate framework of a vocal recital. Shifting between theorbo and the more agile archlute, Marchitelli offers fluent support, occasionally stepping into the spotlight in instrumental numbers – a ciaccona lively with stamp and swagger and Piccinini’s folk-simple ‘Aria di saravanda’. Recorded close, this disc has all the brightness and directness of a live performance, compelling in a way that Raquel Andueza’s similar 2009 ‘D’amore e tormenti’ – a glossy, soft-focus production – just isn’t.